Ward Community Water Scheme chairman John Elliot beside the new water tanks installed this week. 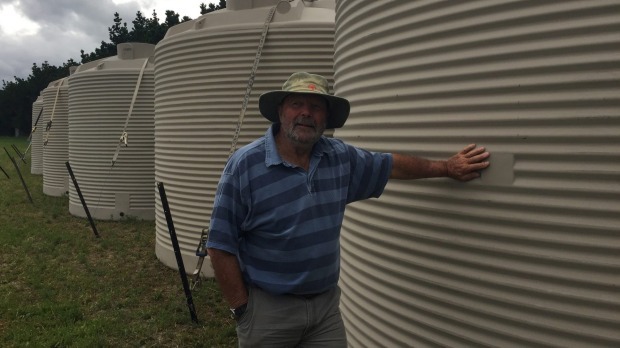 Water supply to a small south Marlborough settlement has been fully restored after eight new 30,000-litre tanks were lifted into place and reconnected to residents' pipelines. Ward was one of several isolated settlements along Marlborough's eastern coast to bear the brunt of the November 14 magnitude 7.8 earthquake. As well as closing State Highway 1 through the town, the quake cut residential water supply to 70 households for three days after the event. 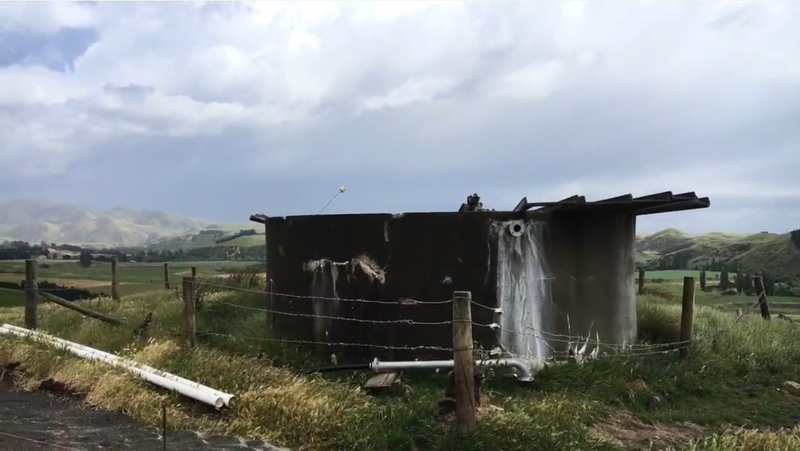 The privately-owned community water scheme, including the pump house, was partially restored shortly after the quake to continue daily supply to residents coping with 25 per cent capacity from one of the existing 60-year-old water tanks. The damaged concrete tanks, which held 200,000 litres for home supply and stock water, were replaced this week when the eight new plastic tanks were dropped in by helicopter. Ward Community Water Scheme chairman John Elliot said the new Promax tanks would add an extra 40,000 litres to the private supply scheme funded by Ward shareholders. The pump house bore, which drew water from the Flaxbourne River, slumped 50 centimetres in the quake damaging one of the two pumps. The water supply had been operating on one pump while workmen concreted the flooring again and reconnected pipelines. "We were able to patch up one of the tanks to restore water to homes about three days after the quake," Elliot said. 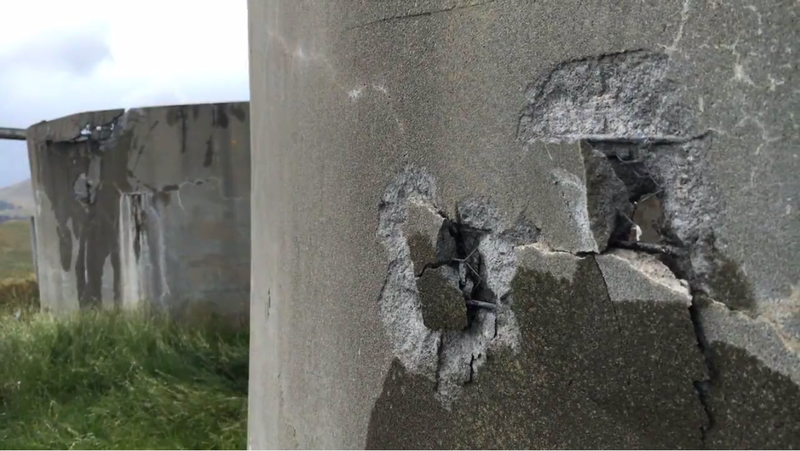 "The roof sections in the old water tanks caved in and battered the inside of the tanks." An automatic cutoff system at the pump house which dislodged from its foundations helped to stem the loss of water. "It got water back on for homes but there is still a few farmers, including myself, who have not had any water for stock during the past fortnight. "The hardest challenge has been to locate the numerous underground leaks in the pipeline." A 40-millimetre alkathene pipe was connected to the existing tank to replace a damaged rigid plastic line running to the township. "Homes have been conserving water until the leaks are fixed," Elliot said. The concrete tanks were built and installed by Ward residents who signed onto the private scheme 60 years ago. The tanks had supplied 70 households on the scheme northwards to Kaka Rd, and south to Tar Barrel Hill, Elliot said. The cost of repairing the supply, which did not cater for farm or vineyard irrigation, was estimated to be $120,000, paid for from buffer funds in the scheme and insurance. THe Marlborough District Council provided $34,000 from emergency reserves for the new tanks and pipes. Extra funding might have to be found to pay for any cost overruns not covered by insurance.